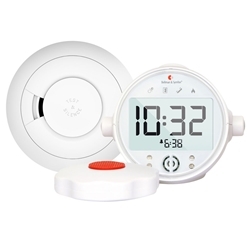 When a fire starts, the Visit Smoke Alarm Transmitter instantly sends a signal to any receiver from the Alarm Clock Visit Receiver, which will then notify you by flashing light, vibration or loud sound. The Visit Smoke Alarm provides early detection of fires so you and your family can get out safely. The Alarm Clock Visit Receiver also doubles as a wake-up alarm, so you never have to worry about oversleeping again! Add Visit transmitters to be alerted to different events, like door or baby cry and receivers to be alerted in multiple rooms. The Safe system includes a smoke detector, alarm clock and bed shaker. It is recommended that you place a smoke alarm near any room that a fire could start in, including the kitchen, dining room, living room and bedrooms. Avoid placing alarms near bathrooms since steam can cause false alarms.